There are many different periods in which you might have a heightened sense of concern for your home: while away on holidays, during festive periods, during periods of increased home invasions within the Brisbane, Gold Coast, Ipswich and Logan areas, during larger scale events or even while certain members of your household are away and you desire an increased sense of security. Depending on your needs and the time frame you require security solutions our team will recommend the best option for you. Our Brisbane security guards provide a variety of home security options, not limited to those discussed below. Our bred and trained guard dogs are a great solution for those looking for a more active deterrent than an electronic security system. 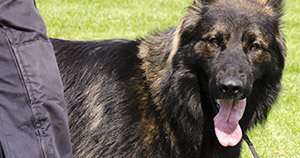 Our dog security and training services mean we select a dog that is best for your needs in both ability and personality. The relationship formed between the dog and yourself means that you and your family are safe from the dog at all times, as part of taking on a professionally trained guard dog at your premises you are taught how to work with the dog, commands and signs of the dog being wary of people. We can discuss with you the suitability of a guard dog verses a family pet trained in security and home protection. Many dogs kept as family pets can be trained in suspicion and security for your person and your home. Our skilled dog trainers can work with your pet to build skills to assist in home protection without compromising their family friendly nature and companionship. Not all dogs are natural barkers and not all dogs are naturally suspicious which is why training your pet can be one of the most advantageous decisions you make for your home security. There are always a number of other security options for your home. Whether you require electronic security systems, roaming drive by security, CCTV or other solutions, our Brisbane or Gold Coast security guards will discuss these and more with you when you are ready. In addition to security options for your private home we offer security solutions for gated communities and retirement villages. As the needs for these establishments vary quite widely from those needed by private homes we recommend an onsite visit by one of our security professionals before deciding on the solution for you. To make an enquiry about our services please contact Queensland Security Solutions.